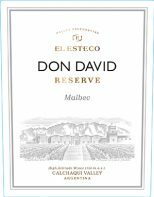 The flagship red varietal of Argentina. This wine shows plum, red fruits, spicy black cherries and cassis with toasted oak notes on the nose and palate. Ripe fruit and linear acidity balance strong but soft, ripe tannins. "Smart Buy. Dried red fruit flavors are lively, offering a surplus of rich, dried savory herb notes. Accents of hot stone and white pepper flood the finish. Drink now through 2023." "Violets, blueberries, mahogany and cloves. Medium body, fine tannins, lovely fresh acidity and a round finish. Drink now." "Bright red-ruby. Blackberry, dark chocolate, licorice, violet and spices on the nose. Nicely intense and delineated in the mouth, showing a suave, smooth texture and lovely inner-mouth lift to its slightly wild dark berry and violet flavors. Fine-grained, fruit-driven wine with lovely saline mineral energy and a smoothly tannic, deceptively long back end."